We had just visited Auschwitz, and I was ovulating. We had spent the day touring barracks where people — including our grandparents — lived in terrible conditions, and gas chambers where people took their final breaths. After such an emotionally and physically draining day, we got back to our hotel in Krakow, and sat there speechless, tears streaming down our faces. My husband and I are the grandchildren of eight Holocaust Survivors — six of whom survived Auschwitz. Being grandchildren of survivors was deeply ingrained within our childhoods, helping to define who we are today. The Holocaust was something we had always heard about, though it was impossible to fully comprehend. The word “Auschwitz” itself carried so much weight. It was the place that many of our family members were murdered, the place where our grandparents were tortured and starved, the place we never wanted to go to, but felt we had to see. 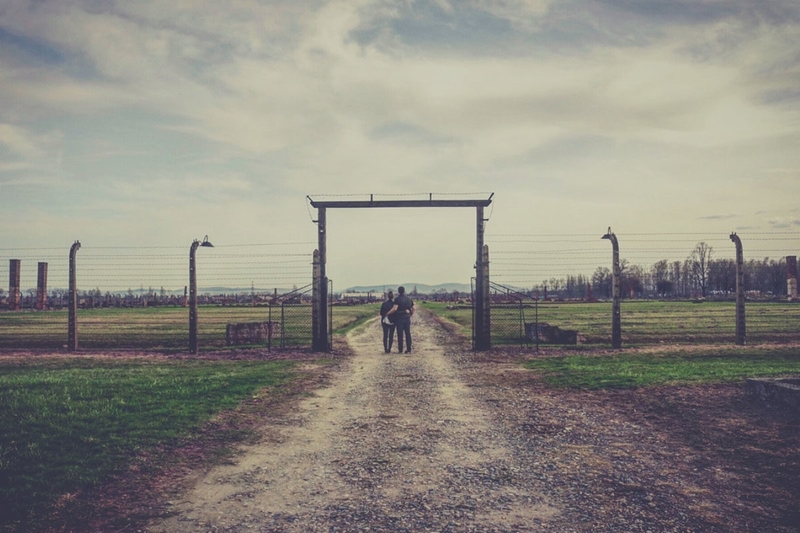 After years of indecision we finally signed up for the International March of the Living, a trip to Poland to learn more about the Holocaust and to examine the roots of prejudice, intolerance, and hatred. 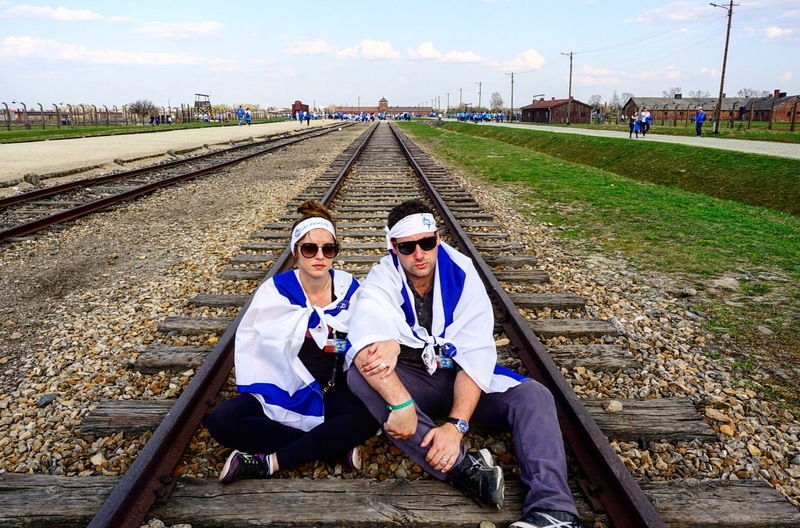 One of the most significant parts of the trip is the march — alongside thousands of Jews from around the world — down the three-kilometer path leading from Auschwitz I to Auschwitz II (Birkenau) on Yom HaShoah, Israel’s Holocaust Remembrance Day. The timing was somewhat tricky, because by the time the trip rolled around, my husband and I were actively trying to have a baby. After five years of marriage, “When are you going to have children?” had become the first question that everyone asked us. Nobody knew that we had been trying without success, and, if I’m being truly honest, I wasn’t convinced that we were ready. I think I hadn’t fully accepted wanting to get pregnant and my body knew that. I was highly focused on my career as an actor and producer — I thought that getting pregnant and starting a family would derail that. But on that day in April, when we visited Auschwitz, something changed. On the train tracks of Auschwitz, I stood exactly where my bubbe’s hand was torn from her little sister’s, whom she would never see again. Her father had told her that she would be the only one from their family to survive. It was a chilling prophecy, and he was right. On the train tracks of Auschwitz, I stood where my Nana was separated from her mother by an SS Officer. Her mother told her to go, and that they would see each other again soon… but that was the last time she saw her mother. On the train tracks of Auschwitz, my husband and I stood silently together, tears streaming down our faces, contemplating how this had happened and wondering how our grandparents had the strength to survive. And in those dark moments, something clicked. Thinking about all the families that were lost — mine included — I felt such a strong desire to start my own. And for the first time, I completely and wholeheartedly wanted a baby. As we stood together at Auschwitz, we truly realized the importance of sharing these stories with future generations, so that the voices of those lost continue to be heard. With our hands clasped, we dreamt aloud of having our own children so we could pass the stories along to the next generation. This meant that, in one of the darkest moments of our lives, we had to find the light and bring life out of all the death that surrounded us. And so, there we were in our little hotel room in Krakow. It wasn’t exactly romantic, but my husband I were connected completely. After seeing Auschwitz with our own eyes, having children felt more important than ever — and as my eyes locked with his, no words were needed. We understood the incredible amount of love we had for each other. The next morning, I didn’t think too much about it — given our history, I wasn’t particularly confident that I would actually get pregnant. When the tour in Poland ended, we continued our personal journey on to Prague, where my grandfather went after the war. This grandfather died before I was born, but I knew that after the war, he and my bubbe saved all the money they could and, in 1947, they opened a restaurant near Prague’s Old New Synagogue. I set out to find it. All I knew was it was near the synagogue, and that its address was number 18, an important spiritual number in Judaism. 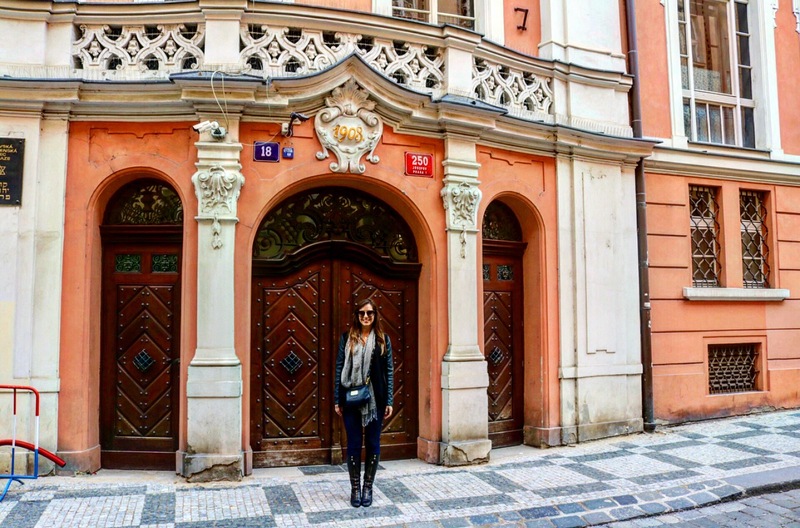 In the past, my family members had gone there and were unable to go inside, because the building is now under strict security, as it now used as offices by the Jewish community of Prague. Like my relatives, my husband and I were turned away at the door. We waited outside until a woman walked out. We told her our story; she kindly offered to go back inside and she took some photos with my phone. I figured this was the closest we would get. But as we waited, we struck up a conversation with an Israeli man who was a member of the community. We told him our story and he said we had to go inside. He spoke to another man, and that man took us inside and gave us a tour of the entire building. I was in tears as I thanked him. I couldn’t believe I was standing in the same place where my grandparents started their lives together, more than 70 years ago. And it so happened that I was wearing my bubbe’s scarf that day and, while I didn’t know it at the time, I was also carrying our child inside of me. A few days later, we returned home, and the following week I took a pregnancy test. Within moments there were two pink lines. I emerged from the bathroom with a smile on my face, and told my husband that we were having a girl. There was no way to know it was a girl, of course, but I felt it — just as I had felt ready to have a baby as we stood on those train tracks. Our baby girl was born in January. We named her Hazel Aubrey; Hazel is after my grandfather Herman, who opened that restaurant at number 18, and Aubrey is after my husband’s grandfather, Abraham, a survivor of Auschwitz. One day, we will tell her the story of her namesakes, and about all eight of her great grandparents who survived the Holocaust. Through their stories, all those voices will continue to be heard, and all those who perished will never be forgotten.